December 29, 2010 -- Digital preservation made important strides during 2010. These happenings aroused the attention of practitioners and, to the greatest extent yet, the mainstream media. One way to look at this is that greater popular awareness of digital preservation flows from a growing importance of the subject for the work of institutions and the lives of individuals. This list covers events, trends and other developments covered in digitalpreservation.gov stories during 2010. Given that our home is the National Digital Information Infrastructure and Preservation Program, many of these stories relate to the Library of Congress. We do, however, cover other activities that take place around the world. On April 14, the Library announced—via Twitter—that it is " to acquire ENTIRE Twitter archive. (external link)" The reaction from the media, both old and new, was enormous. The subject surged as a top "trending topic" on Twitter for days, eclipsing even celebrities such as Justin Bieber. Stories appeared in major media outlets around the world and stirred a broad range of reactions. Yet whether people approved or disapproved of the acquisition, it made plain that digital information documenting social media had achieved a new status. "The Twitter digital archive has extraordinary potential for research into our contemporary way of life," said Librarian of Congress James H. Billington. "Working with the Twitter archive will help the Library extend its capability to provide stewardship for very large sets of born-digital materials." 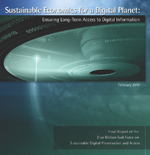 Release of Sustainable Economics for a Digital Planet: Ensuring Long-Term Access to Digital Information (external link) (PDF) capped the work of a group brought together by eight major funders and cultural heritage organizations. The report reflected two years of work by economists, computer scientists, librarians and archivists to consider how best to ensure that digital preservation efforts receive adequate resources. A National Conversation on the Economic Sustainability of Digital Information (external link), a symposium held at the Smithsonian immediately after issuance of the report, helped spread the word. News stories appeared in The New York Times (external link), Information Today (external link) and Variety (external link). Work by a Library of Congress project to address the challenge of ensuring access to older versions of Websites won the prestigious Digital Preservation Award 2010 (external link). The Memento Project, led by researchers at Los Alamos National Laboratory and Old Dominion University, won the prize over four other nominees, including two other NDIIPP-related projects, the Blue Ribbon Task Force on Sustainable Digital Preservation and Access and the Preserving Virtual Worlds project, lead by the University of Illinois at Urbana-Champaign. The award, given by the Institute for Conservation and the Digital Preservation Coalition, and supported by Sir Paul McCartney, celebrates the highest standards worldwide in the field of digital preservation. Many digital preservation practitioners believe that building broader awareness of the subject is essential. Given that video on the Web is extremely popular, it makes sense to consider the medium for delivering the digital preservation message. NDIIPP put out six short videos in 2010, including Why Digital Preservation is Important for You, Digital Natives Explore Digital Preservation, Archiving Digital Photos and Bridging Physical and Digital Preservation. The program released longer videos, including Data Conservancy: A Web Science View of Data Curation, featuring Sayeed Choudhury, associate dean for Library Digital Programs at Johns Hopkins University. Digital Preservation Europe also produced some memorable videos featuring Digiman, including Team Digital Preservation and the Arctic Mountain Adventure (external link). NDIIPP has always been based on the idea that collaboration is the best way to advance digital preservation, and 2010 witnessed several important developments with that approach. The Library launched the National Digital Stewardship Alliance as an outgrowth of NDIIPP that will improve preservation standards and practices; work with experts to identify categories of digital information that are most worthy of preservation; and take steps to incorporate content into a national collection. Another collaborative effort, Lots of Copies Keep Stuff Safe, which is based at Stanford University, made news by expanding users and adding to knowledge about the challenges of bit-preservation. The Hathi Trust (external link), a partnership of major research institutions and libraries also drew attention by adding many new members who will help preserve the cultural record in digital form. The Preservation and Long-term Access through Networked Services project (external link), a four-year effort of the European Union and a number of major libraries, made a splash in 2010. Much of the news came through deposit of a " digital genome in Swiss Fort Knox." This time capsule with a variety of digital formats was a savvy media event that drew world-wide press coverage. The project also drew attention for its transformation into the Open Planets Foundation, which aims to support digital preservation using "a solution that is widely adopted and actively being practiced by national heritage organizations and beyond. 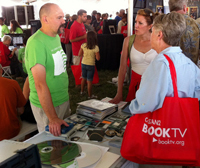 (external link)"
NDIIPP staff speak with the general public about saving personal digital information at the 2010 National Book Festival. NDIIPP focused significant attention on personal archiving information and outreach this year. In addition to the videos noted above, program staff interacted with hundreds of people during the Library’s first Personal Archiving Day in May and also again in September during the National Book Festival. Staff also worked with the Smithsonian National Museum of African American History and Culture during outreach visits in Topeka, KS, and Detroit, MI, as part of the Save Our African American Treasures program. 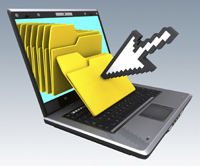 The personal archiving section of the digitalpreservation.gov Website was substantially revised with specific tips for a variety of digital formats and material. The Library also kept abreast of other work in the area, including the Digital Lives research project at the British Library. NDIIPP devoted much attention during 2010 to preserving geospatial data. Building on work from a library meeting in November 2009, Framing a National Preservation and Access Strategy for Geospatial Data, NDIIPP partnered with the Center for International Earth Science Information Network at the Columbia University Earth Institute to launch a Geospatial Data Preservation Clearinghouse. NDIIPP also hosted a follow-up meeting with a variety of experts to consider issues associated with geospatial data appraisal and selection. Staff worked closely with the Geospatial Multistate Archive and Preservation Partnership to communicate project results at the ESRI Federal User Conference. ESRI published an article in ArcNews, Library of Congress Takes Leadership, about NDIIPP work relating to geospatial data preservation. Representatives from the Smithsonian, National Archives and Records Administration, National Gallery of Art, and many other federal agencies, made fine progress in developing common guidelines for digital images and audio visual materials. The FAGDI Still Images Working Group released a set of recommended best practices, "Technical Guidelines for Digitizing Cultural Heritage Materials" and updated several documents including an authoritative listing of digital imaging standards. The Audio-Visual Working Group convened a user-community meeting during the AMIA/IASA 2010 joint conference to discuss a draft version of the MXF Application Specification for Archiving and Preservation. FAGDI also was the subject of a detailed article in Federal Computer Week focusing on the group’s work to help government agencies preserve audio-visual information in digital form. 2010 saw heightened interest in using computer forensics techniques, similar to those used in criminal investigations, to work with digital content of cultural heritage interest. The University of Maryland’s Maryland Institute for Technology in the Humanities led the way with a conference, Computer Forensics and Cultural Heritage. More than fifty international participants attended the meeting and discussed a range of new questions relating to the extent to which paper-based archival practices apply to born-digital collections and how best to apply existing forensic techniques for curatorial purposes. The meeting also served as a forum to consider issues discussed in a subsequent report, Digital Forensics and Born-Digital Content in Cultural Heritage Collections (external link), published later in the year.